The Celestron 44326 Amoeba digital microscope is a dual-purpose microscope that can be used as a low-power or traditional microscope for a variety of applications. 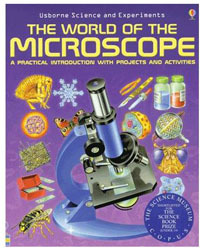 This microscope comprises a 1.3 MP built-in digital camera, that allows you to easily capture photos and videos. 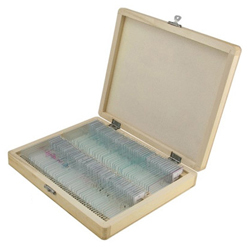 The LED illumination above and below the stage assist in easy viewing of 3D specimens or microscope slides. Store captured photos and clips on a SD card or transfer them to your personal computer via included USB cable. The Amoeba allows for plug and play compatibility with both windows and mac computers, while the included ULead photo software lets you save and share files with others. 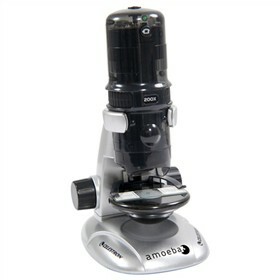 With features like LED illumination, coarse focusing with dual knobs, and a 3.2" diameter plain stage, this microscope is a fun and educational tool for hobbyists as well as students alike. The Celestron 44326 has many exciting features for users of all types. See the Celestron 44326 product video and gallery images above for more details. 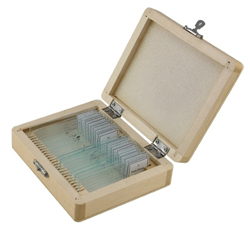 FactoryOutletStore stocks a full line of accessories like 100 Piece Prepared Slide Kit, 25 Piece Prepared Slide Kit, and The World of Microscope for the Celestron 44326. The Celestron 44326 is sold as a Brand New Unopened Item.